Information on Niacin Deficiency and Pellagra and How to Avoid Them! Niacin is a used pharmaceutically for managing dyslipidemic conditions, and to reduce the chances of suffering a cardiovascular event. Niacin vitamin has been used historically to treat pellagra, but it is also a part of contemporary therapeutics. These days you’ll be hard pressed to find a case of niacin deficiency in a developed country. It mostly only affects people living in poverty or people suffering from alcoholism and malnutrition. Even so, pellagra is still a problem in developing countries; especially counties where people mainly eat maize as part of a food emergency or a refugee program. Pellagra is a deficiency disease that is caused by low amounts of niacin and/or tryptophan. The disease causes skin changes, along with changes in the gastrointestinal tract and nervous system. There are “four Ds” associated with pellagra; dermatitis, diarrhea, and dementia, and finally death. Out of these symptoms, the skin changes is one of the most prominent signs of the disease. The initial erythema looks like the sunburn, and it is evenly distributed on the skin exposed to sunlight. This erythema also comes with burning and itching, along with scaling and skin exfoliation. You can clearly tell the difference between infected and normal skin because there is a clear zone of demarcation. The changes to the gastrointestinal tract can cause excessive salivation, nausea, a burning sensation in the epigastrium and also diarrhea. It leaves the mouth sore, and the tongue was swollen and beef red. These gastrointestinal symptoms will often present before dermatitis does, leading people to see that pellagra starts in the stomach. Bacterial infections can worsen the diarrhea symptoms and they can also lead to anemia. Pellagra also causes neurological symptoms including anxiety, depression, and fatigues early on. As the disease develops, it can lead to headaches, dizziness, irritability, and tremors. Although these mental problems are initially psychoneurotic, the disease can cause nerve damage through lesions. Roughly 4-10% of chronic pellagra patients develop dementia. 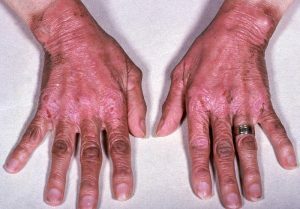 Diagnosing pellagra is typically easy in patients who have dermatitis. However, these skin lesions might be invisible if people haven’t exposed their skin to sunlight. The three main symptoms of pellagra also don’t present clearly in children so it can be hard to diagnose them. Recent studies have confirmed that if an adult wishes to avoid a niacin deficiency they should eat 6.6 niacin equivalents per 1000 calories per day and no less than 13 niacin equivalents if you are eating less than 2000 calories per day. This means that a man eating an average of 3200 calories per day would also need to eat 21.1 niacin equivalents and a woman eating an average of 2300 calories would need to eat 15.2 niacin equivalents a day. For children aged six months or older, the recommended niacin intake of 6.6 niacin equivalents per 1000 calories is accepted. Younger infants will need eight niacin equivalents per 1000 calories, which can be gained through breast milk from a well-nourished mother. While there is no evidence to suggest that pregnant or breastfeeding mothers should take in more niacin, the United States National Research Council do recommend that lactating women should get 5.0 extra niacin equivalents due to the 1.5mg of niacin that goes into 850ml of breast milk along with the additional energy that goes into producing the breast milk.